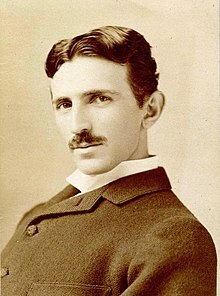 inventor, physicist, mechanical engineer and electrical engineer who is recognized as among the most accomplished scientists of the late 19th and early 20th centuries. It is imperative that contributors search the renewal databases and ascertain that there is no evidence of a copyright renewal before using this license. Failure to do so will result in the deletion of the work as a copyright violation. The author died in 1943, so works by this author are also in the public domain in countries and areas where the copyright term is the author's life plus 75 years or less. Works by this author may also be in the public domain in countries and areas with longer native copyright terms that apply the rule of the shorter term to foreign works.